Russia's armed "aerosleds" may look like science fiction, but they're a real part of Russia's history. As invading armies tried merely to survive the intense Russian winters, the Russians thrived, due in large part to the bizarre, Star Wars-esque snowcraft. The development of Russia's technology and infrastructure in the 20th century occurred unevenly, leaving them early on with the ability to build increasingly advanced internal combustion engines for cars and trucks but without well-built roads to drive them on. With much of the country's borders submerged in snow for months at a time the need for winter vehicles was obvious. Early designs were essentially skiing machines fitted with old airplane engines and propellers. 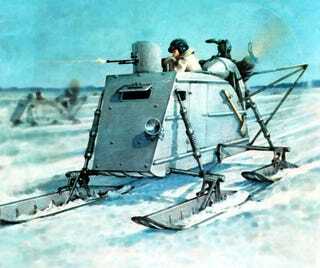 Though capable of crossing short distances on snow, their mostly wooden construction made them unlikely war machines and they served mostly in support (transportation, logistics, communications) through World War I. After the revolution, the new Russian government assembled a team of its great inventors to improve on the designs and create more useful, combat-ready metal snowmobiles they called "aerosleds." A. N. Tupolev's ANT designs, particularly, favored metal aluminum construction and used powerful FIAT engines. When the Winter War broke out between the Soviet Union and Finland in 1939, the intense cold and rough conditions favored the Soviet Army and their fast aerosleds, which were used as ambulances and as patrol vehicles in isolated areas. This experience led to the production of numerous models with heavier armor plating and large machine gun mounts. The GAZ-98 snowmobiles used cheaply produced automotive engines and were created in much greater numbers. The light machines, even with some metal armor, weren't ready to go up against a tank so the Russians used them successfully for surprise attacks. While the Germans attempted maneuvers on skis, the swift Russians would sweep in behind them dropping troops and supplies. As the war stretched into the winter of 1942-43, the Soviet Army created more heavily armored vehicles like the NKL-26, which featured a 10 mm armor plate up front and usually a 7.62 mm machine gun on the roof. These vehicles could cross lakes and pierce encampments while towing soldiers on skis. They also look curiously like the AT-ST walkers from Star Wars. The various snowmobiles used in the first half of the 20th century gave the Soviets a means of survival and an edge in combat along their borders. Aerosleds continued to be used in remote areas, but experience with tracked vehicles during the post-war years led to the creation of giant articulated tracked vehicles like the more amphibious DT-LP vehicles. Perhaps some crazy Russian oligarch can buy an Erkanoplan and throw a couple of these in the back for the ultimate in strange Soviet transportation.